The Senate Judiciary Committee has approved President Donald Trump’s pick for attorney general, William Barr, on Feb. 7. His nomination now heads to the full Senate, where Barr is expected to be confirmed. Barr’s nomination was passed along party lines, where 12 Republican senators voted for the nomination and 10 Democrats voted against it. Republicans praised Barr as well qualified, while Democrats had largely opposed his nomination, saying that they were concerned he would not fully release the findings of special counsel Robert Mueller’s Russia investigation. If Barr, 68, gets confirmed, he would replace Jeff Sessions, who resigned at Trump’s request a day after the November midterm elections. The office is being held in the interim by the former chief of staff under Sessions, Matthew Whitaker. Barr would inherit a department that under Sessions’ leadership sought to implement Trump’s tough stance on illegal immigration and operations against human trafficking, drug trafficking, and transnational gangs, particularly MS-13. He would also oversee the special counsel investigation into allegations that the Trump campaign colluded with Russia to sway the 2016 election. Recently, there have been signs that the investigation is nearing its end after a year and a half and a slew of indictments, none of which have substantiated the allegations. Before that, he served as deputy attorney general in the Justice Department, and in the CIA while attending law school. Toward the end of his time at the agency, he “occasionally helped write [a] testimony for the [CIA] director,” who, at the time, was Bush, the paper said. After leaving the Bush administration, Barr returned to private practice. He sat on the board at Dominion Energy, a $52 billion power and energy company headquartered in Richmond, Va, since 2009. He also sat on the board at Time Warner between 2009 and 2018. And since 2017, he has also been on the External Advisory Board to the CIA director. He has also been on Trump’s Intelligence Advisory Board (pdf) since 2018. On Dec. 7, President Trump said he would nominate Barr to return to lead the Justice Department. “He was my first choice from day one,” Trump said at the time. 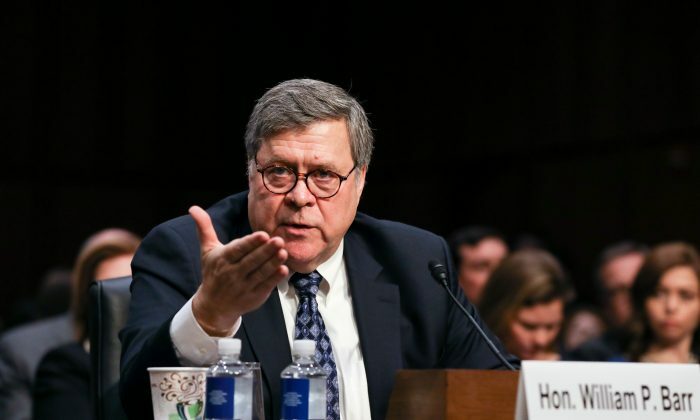 During his confirmation hearing before the Senate Judiciary Committee on Jan. 15, Barr addressed how some of his positions were portrayed in the media, particularly regarding the Mueller probe. He said he took issue with the probe on only two points: Mueller should have had a greater balance of political leanings on his team (most of the team donated to Democrats), and the Mueller team was incorrect in considering a potential obstruction of justice case against Trump. Mueller was appointed in 2017 by Deputy Attorney General Rod Rosenstein to take over an FBI probe of Russian interference into the 2016 elections, as well as allegations that Trump’s presidential election campaign had colluded with the interference. But so far no evidence of collusion has emerged. Barr said based on public information, he was under the impression that Mueller was planning to raise the claim that Trump obstructed justice by firing then-FBI Director James Comey in 2017 and by telling Comey he “hoped” Comey could “let … go” of further inquiries into former National Security Advisor Michael Flynn. Trump denied making such a comment. Aside from that Barr said it is “vital” Mueller is free to finish his work. “I think we have to get to the bottom of it,” he said, referring to the Russian meddling. “I believe it is in the best interest of everyone, the President, Congress, and most importantly, the American people, that this matter be resolved by allowing the Special Counsel to complete his work,” Barr said during the confirmation. “I can assure that, where judgments are to be made by me, I will make those judgments based solely on the law and I will let no personal, political, or other improper interests influence my decision,” he added. He said he has known Mueller for 30 years and trusts him to conduct the investigation properly and fairly to the president. Barr committed to releasing as much of the expected Mueller report as laws and regulations allow and promised Trump will not rewrite the report. Epoch Times Petr Svab and Reuters contributed to this report.